My children are fascinated with pictures of themselves as babies. They love hearing stories about what they were like when they were little. Their fascination with their own birth stories inevitably led to one of the questions that parents find most difficult to answer – where do babies come from? On a recent trip to the library, I discovered a book that addresses this question for the youngest readers. “Young children are curious about almost everything. Asking questions is one of the many ways they learn about themselves and the world around them. The Let’s Talk About YOU and ME series provides the youngest children with easy to understand facts and reassuring answers to their delightful, thoughtful, and often nonstop questions. In WHAT’S IN THERE? Gus and Nellie learn that there’s going to be a baby in their family. Follow them through the seasons as they watch their mother’s pregnancy with fascination and curiosity until the new baby is born. What’s In There? is a helpful book for presenting information and opening discussions with young children who are curious about pregnancy and birth. 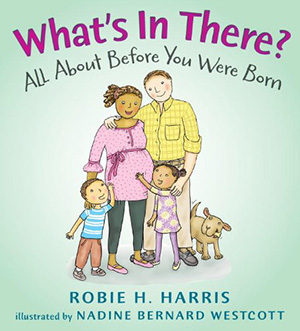 Author Robie Harris begins by debunking the misconception that a baby is carried inside a mother’s tummy. She introduces the appropriate names for female reproductive organs and discusses in simple terms how a baby is made (babies begin as one tiny cell, half from the woman’s body, the other half from a man’s body). Through simple and concise language, Harris describes how a baby develops inside a woman’s body and how it is born. There’s nothing clinical about the down to earth writing and Harris’s story emphasizes the idea that the arrival of a new family member is both an amazing and wonderful thing. Why I like this book: The books goes into enough detail to satisfy a child’s curiosity without going into too much detail. Activities and Resources: Keep it simple. Our kids have seen pictures of themselves in utero (from the ultrasounds that were performed). We also have lots of pictures of them with family on their birth days. This seems to satisfy their curiosity...for now. Looking for other great books? Check out Susanna Leonard Hill's Perfect Picture Book List updated every Friday.